A thoughtful and useful gift for any time of year, this personalised keepsake box is a gift that every couple or family can have fun making use of. 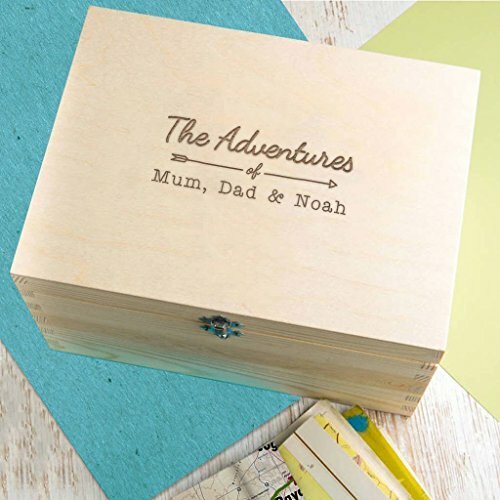 Perfect for storing reminders of happy memories, travels, or family photos – they will enjoy rifling through this box in years to come as much as they did filling it! Made from natural wood that highlights the beauty of the wood grain, the box has a simplistic and un-fussy finish which will compliment any decor. Box 1 (28cm x 21cm x 13cm) includes a lift up lid secured with vintage style latch and fixings. Box 2 (28cm x 21cm x 13cm) is fantastic for storing and organising small items as it comes with an integrated internal storage tray. Box 3 (35cm x 25cm x 20cm) our largest storage box includes a lift off lid and cutout handles for easy carrying.